A student of mine was on a boat charter for three days of diving in the Channel Islands off Southern California. It is an annual trip where a bunch of our instructors, students and customers dive like crazy for three days. 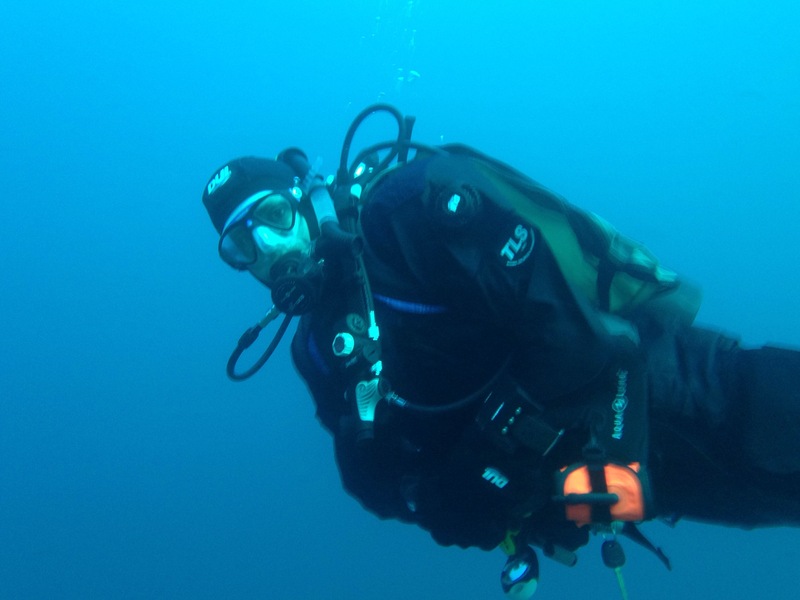 He was diving in a group that included two instructors and a “fairly experienced” dive master. The foursome jumped into the water and started swimming around a small island. As the dive progressed, the student watched his tank pressure drop at the same time as the group was swimming further and further from the boat. He gave a “half tank” signal resembling a karate chop into his opposite palm. The group kept swimming. Eventually, he got to a point where he needed to surface—somewhere around 700psi. His “buddies” were beyond a range where he could get their attention so he surfaced alone with enough air, in his view, to support his swim back to the boat if the conditions were choppy. And, they were. Worse, he surfaced fairly close to a rocky wall and was taking a beating from the combined forces of the surge, chop and back-swell bouncing off the wall. Although a good diver, this student is a relatively new diver with about 80 dives to his credit. He holds a PADI Master Scuba Diver rating. Until this particular dive, all his dives had taken place in relatively calm conditions. Upon surfacing, he found himself in an environment he had not experienced before. Water was beating him over the head, reflecting off the wall, and beating him in the head again. He felt heavy, tired, and, I’m guessing, scared. He also neglected to inflate his BC. Eventually, the other divers surfaced, and one of the instructors asked, “did you inflate your BCD?” He recalls telling him he had, but in reality, he hadn’t. Not long after, they got him positively buoyant, and assisted him safely back to the boat. When we talked about it, he was very candid about the idea that he could be a “Master Diver” and still have gotten into a situation like that. It goes without saying that titles are not a replacement for experience. This is why we tell students to dive in conditions they are familiar with. I often tell people that, in diving, everything is fine, until it’s not. This is an example of that idea. That’s where experience comes in. Sometimes, it is impossible to avoid a bad situation. Tides change, surf comes up, things break and people do stupid things. It’s easy to be lulled into believing that all dives are the same when all of your dives up to a certain date have been the same. After our discussion I asked him to reflect on all the diving that took place during that trip. Did you plan those dives? Did everyone on the buddy team know what that plan was? Did you stick to the plan? Was there any contingency planning? Did you go over hand signals? In reality, no one on the boat was doing any real planning, which is unfortunately, typical. If they had, his buddies would have understood his karate chop “half tank” signal. Ideally, they’d have decided on a turn pressure and stuck to it. And, they would have agreed about the navigation. Of all the lessons we can learn to make us better divers, planning is too often overlooked. Divers tend to just start swimming. I think this is the connection to Mr. Chatterton’s blog post. He uses the term “accomplished bad diver” to describe the now dead, Ed. Ed’s fatal flaw was that he refused to learn. The fact that he could keep it together 200 feet down, long enough to find someone with an available gas supply is amazing to me. The fact that the experience wasn’t disturbing enough to make him re-learn the fundamentals of gas management, is shocking. About a month ago I made a dive with the guy I mentioned earlier, along with another instructor. It was just a fun dive to around 105 feet (Lake Tahoe, so 6228 feet altitude) where we planned to descend to 100 feet on a steep slope, then hang a left remaining at that depth until we’d get to about a 100 year old truck chassis that was converted to a log carrier back when clear cutting was still going on in the Tahoe basin. I was diving with my Shearwater Petrel dive computer, with the gradient factor set very conservatively. My dive buddies each had 8 or 9 minutes of no decompression time remaining, compared to my 2. And, both were actually below me by a few feet throughout most of the dive. The difference was my very conservative GF. I’m a technical diver. On this dive, I was in full technical dive gear (to practice shut down drills, etc.). I had full doubles, redundant regulators, isolator bar, plate, dual bladder wing, dry suit, a deco bottle full of 40% Nitrox, a backup timer/tables and a lift bag and reel. I was 100% equipped and trained to stay on the bottom as long as they could and simply hang for 6 or 7 minutes on the way up. But, I didn’t. We began our ascent 2 minutes after reaching the truck. We tell students to plan their dives and stick to that plan. To me, that means anytime things deviate form that plan, either the dive ends while the situation is still relatively safe –or– the team moves into safer water (shallower, more sheltered, etc.). We planned that dive very carefully as a computer profile, no-decompression dive. Sticking to the plan means you don’t change it, especially with a big decision that could potentially impact the group, like going from non-deco to deco. Afterward we talked about the dive and the reason for the short stay on the bottom. No one was upset about it. It was a great dive. But, I wanted to express my opinion that discipline is a critical part of safe diving, no matter how great the dive, or how easy it would’ve been to extend it. Too often dive students see their instructors bend the rules they teach. Topping that list is dive planning. For starters, when every diver agrees to a plan, it is much easier to recognize a problem and take corrective action before the problem elevates into a full blown crisis. For example, when every member of the dive team agrees to 105 foot maximum depth, but one diver descends to 115, that should throw up a red flag with the rest of the divers. Whereas, had no explicit floor been established, an extra 10 feet may seem normal. Dive plans highlight deviations, which can mean the difference between a problem being recognized early, or one that erodes into something much more serious. Put simply, disciplined divers are safer divers in general because there are fewer surprises. That’s what dead Ed in the article never learned. He had no business attempting recreational dives, let alone deep, technical dives. He simply didn’t have the discipline. In the end, it got him killed. This entry was posted in Diving Safety, SCUBA Instruction and tagged diving safety, lake tahoe diving, scuba instruction.